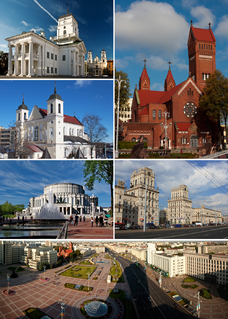 The 65th Belarusian Chess Championship (65th) was held 18–28 February 1999. GM Viacheslav Dydyshko won the 12-player, single round-robin tournament, earning his tenth championship in 26 attempts. The Veresov Opening (also known as the Richter-Veresov Attack after International Master Kurt Richter) begins either 1. d4 Nf6 2. 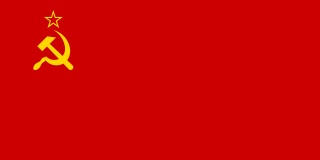 Nc3 d5 3. Bg5 or, more commonly, 1. d4 d5 2. Nc3 Nf6 3. 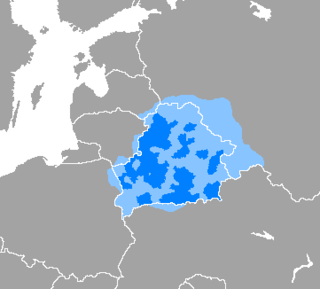 Bg5. After 3.Bg5, Black's most popular choices are 3... Nbd7, 3... e6, 3... Bf5, 3... c6 and 3... c5, all potentially leading to different variations, with 3...e6 4. e4 giving a French Defence by transposition. White's plans typically include rapid Queenside castling, and an early f2-f3 and e2-e4 pawn push. The ECO code for the Richter-Veresov Attack is D01. Kurt Paul Otto Joseph Richter was a German chess International Master and chess writer. The Encyclopedia of Chess Openings is a classification system for the opening moves in chess. It is presented as a five-volume book collection describing chess openings. The moves were taken from hundreds of thousands of games between masters, from published analysis in the Chess Informant since 1966, and then compiled by notable chess players. The main editor is Aleksandar Matanović. Both the ECO and the Chess Informant are published by the Serbian company Šahovski Informator. These openings are typically provided in an ECO table that concisely presents the best opening lines. A chess opening or simply an opening refers to the initial moves of a chess game. The term can refer to the initial moves by either side, White or Black, but an opening by Black may also be known as a defense. There are dozens of different openings, and hundreds of variants. The Oxford Companion to Chess lists 1,327 named openings and variants. These vary widely in character from quietpositional play to wild tactical play. In addition to referring to specific move sequences, the opening is the first phase of a chess game, the other phases being the middlegame and the endgame. In chess, checkmates in the opening are examples of a player being checkmated during the first few moves of the game. Some common or notable mating patterns have names of their own. These include Fool's mate, Scholar's mate, and Légal's mate. Chessgames.com is an Internet chess community with over 224,000 members. The site maintains a large database of chess games, where each game has its own discussion page for comments and analysis. Limited primarily to games where at least one player is of master strength, the database begins with the earliest known recorded games and is updated with games from current top-level tournaments. Basic membership is free, and the site is open to players at all levels of ability, with additional features available for Premium members. 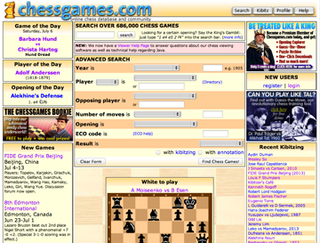 While the primary purpose of Chessgames.com is to provide an outlet for chess discussion and analysis, consultation games are periodically organized with teams of members playing either other teams of members or very strong masters, including a former US champion and two former world correspondence champions. Members can maintain their own discussion pages, and there are features to assist study of openings, endgames and sacrifices. The front page also features a puzzle of the day, player of the day, and game of the day, the puzzle varying in difficulty throughout the week from "very easy" on Mondays to "insane" on Sundays.